Planning to grow onions in your garden or to stock up on onions at the farmer's market while they're in season? If you want your onions to keep for months, it's important to select storage onions. These are heirloom or hybrid onion varieties that have proven to hold up well under long-term storage. Most storage onions are long-day varieties, meaning they require 14 hours or more of sunlight to grow properly. Because of this, they are best suited to being grown in northern states. If you live in the south, choose a short-day variety, like Red Bull. You'll be much happier with the results. As you can see from the list, there are far more yellow storage onions to choose from than red or white, but it's certainly possible to grow a mix. Since some storage onions have a longer storage life than others, so many gardeners opt to grow a variety of keeping onions; then, they simply use the ones with the shortest storage life first. This is a smart way to ensure that you'll have plenty of onions to take you through to next year's harvest. Start your onions as soon as the ground is workable, so they're well established before the hot weather sets in. A good rule of thumb is to plant your onions outdoors when you're starting the rest of your seeds indoors. How you store your onions is just as important as choosing the right onions to store. Homegrown onions need to be cured before they're put up for the winter. This is a simple process, whereby the onion skins are allowed to dry and harden. Here are complete instructions for curing onions. Once your onions have cured, choose a cool, dry, dark place to store them. A location with a 40-45 degree temperature is ideal. This method of storing your onions allows for good air circulation. If you have a large harvest, they can also be stored in mesh bags or braids. Do not store your onions near your potatoes. They each emit a gas that causes the other one to sprout and spoil faster. Those wooden boxes that are made to store onions and potatoes in the same container are a bad idea. So is storing your onions in the refrigerator. The damp environment will shorten their storage life, and make them prone to mold. Green onions are the only exception. They can be stored in the fridge with good results. 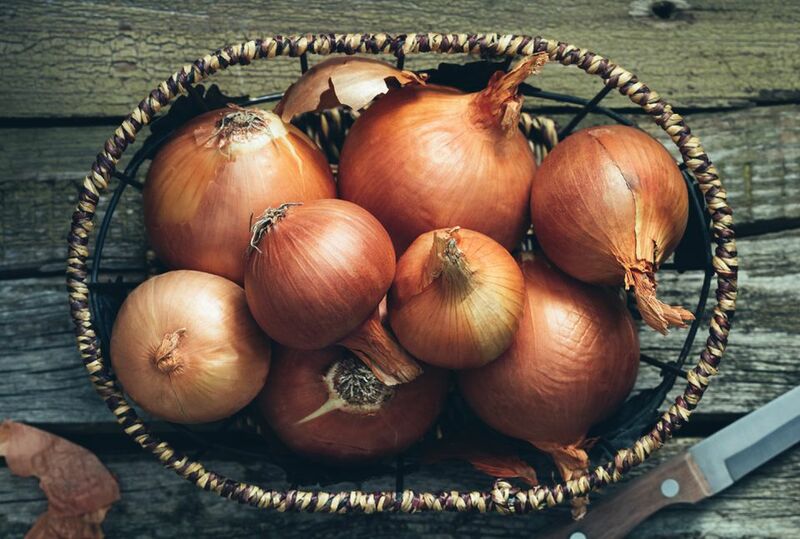 For the best flavor, avoid storing your onions in an area where they'll be exposed to light. This is likely to make them bitter over time. Most storage onions last at least 8 months, but some can last up to 12 months. Inspect your onions regularly, and use up any soft ones first. Discard any that show signs of mold or rot, so that other onions aren't affected. If you had a particularly wet growing season, your onions probably aren't going to keep very well no matter what you do. To ensure your onions don't go bad before you have a chance to use them, you may find it's best to chop and freeze them instead of storing them. Here's how to go about freezing onions. Drying your onions is another great way to preserve their quality. Learn how to make onion powder and onion salt, and you'll have two fewer things to buy for your pantry.